"Beginning of the Great Revival" details the period of the Chinese Revolution starting in 1911 and follows the rise of the Communist Party and its leader Mao Tse-Tung. 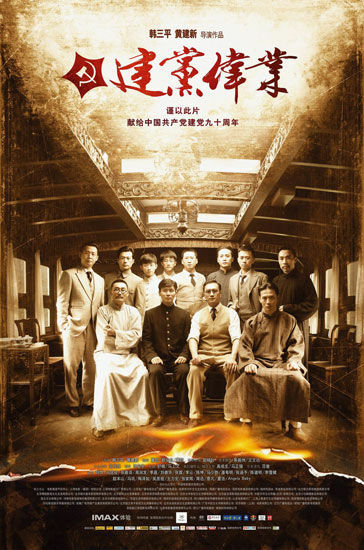 "The Founding of a Party" will be released in July, 2011 to coincide with the 90th anniversary of the Chinese Communist Party. maneki hobbang Oct 04 2011 5:29 pm if you don't recognize most of the actors, the movie seems pointless. but if you do, it's the best. it's especially hilarious to see comedians and idols act as the government leaders. Sherry Mar 26 2011 1:15 pm Oh my GoD!! It's quite a shocked!! Zhao Wei is not on the list!!!!! I'm not going to watch this! !